The past few months (about 12, I believe) we’ve had significant vehicle issues. Significant. Popped tires, dead alternator, misc broken parts, transmissions (yes, plural), and a blown engine. (These is particularly important if you want to use your vehicle to get places. However, I can get you a great deal on a large paperweight if you’re interested.) Despite all these issues no one has gotten hurt. Nor where the kids with us any time a vehicle broke down mid-journey. Those are big things for which to be grateful!! Because of the vehicle issues the kids and I have been home. A lot. I’ve had to be creative to keep us from going completely crazy. Thanks to Pinterest and other internet sites I have started a ‘bucket list’ for summer activities for us. It’s been really cool. Today’s was awesome and I highly recommend it! Easy prep with two hours of payoff. A momma can’t ask for better than that!! I got the idea from here to make a block of ice to dig into. 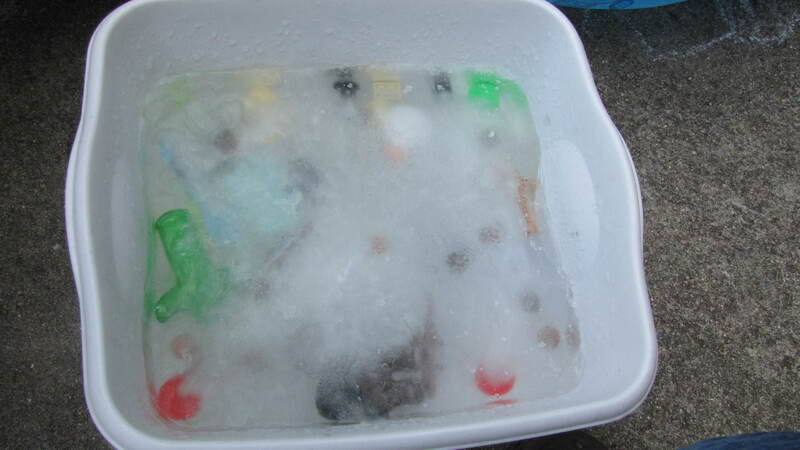 First I collected some of the kids’ toys that could handle being wet and frozen. Then I took a big wash basin and filled it with water. 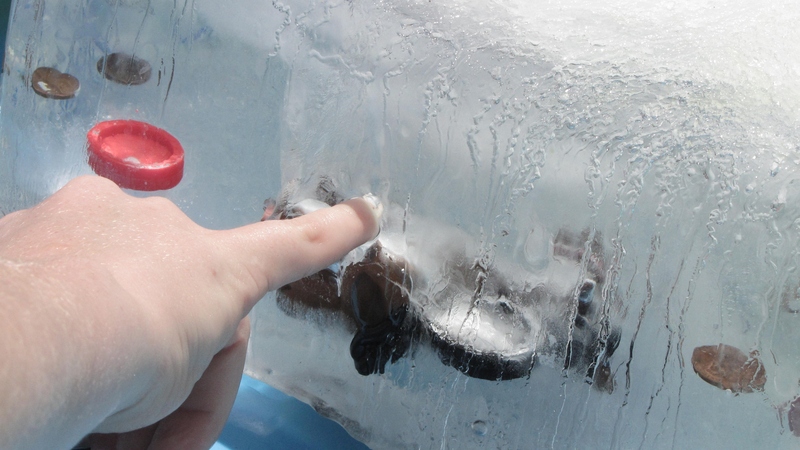 I dumped the toys in and tried to stick in the freezer. This is the point where I made a critical error, thinking I could ‘wing it’ when I stuck the big basin of water in the freezer. Even now I’m shaking my head at my lack of thought! After I reorganized and cleaned (and got all the water out of the bottom) I found a stable, level surface for the basin and added more water to let the freezer work its magic. 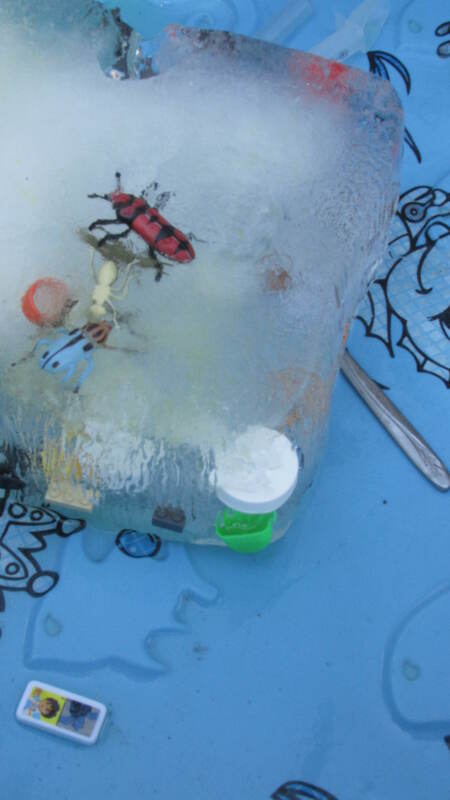 Twice I added more items and water so I had three layers of toys in the ice. It would have been really cool to color the water different colors so the kids could see the layers. But I didn’t think of that till this minute. So if you try it please let me know how it goes! 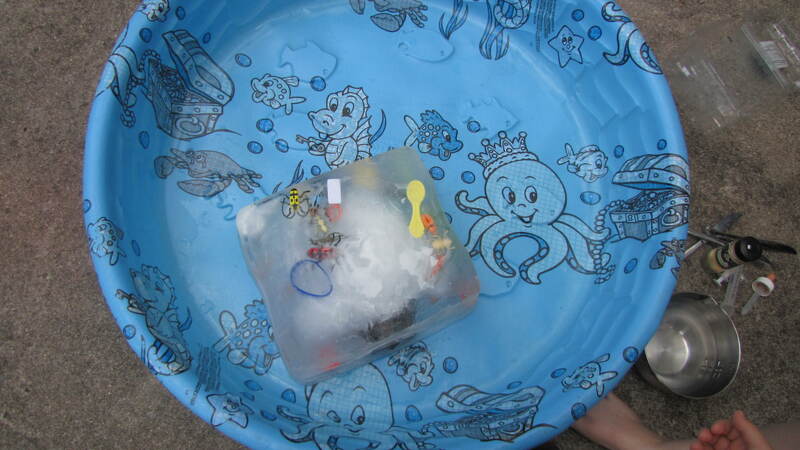 After I had a large solid block of ice with toys and misc items in it, I gathered the other supplies. Medicine droppers, blunt table knives, salt (which I added a few drops of food coloring to), and warm water. 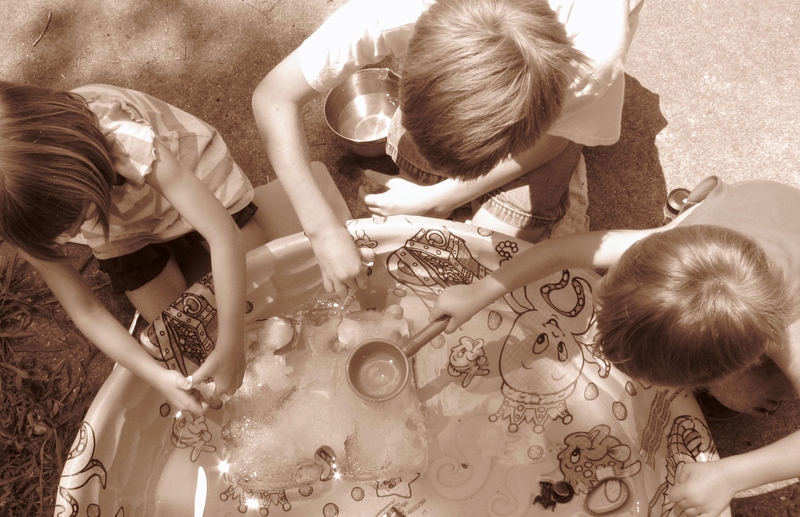 The kids loved doing this activity, though my two year old was the first one to get bored with it. I think he would have liked a thinner layer of ice better so he could get items out easier. However, my oldest repeated over and over again how fun it was! The block of ice waiting in the pool. Working on freeing a plastic bug. The water is yellow because of the food coloring I added to the salt. My oldest still digging after his siblings were done.